The Allen Telescope Array, which was used to search for signs of alien communications around a strangely dimming star. If alien civilizations are broadcasting from around a strangely behaving star, they aren't chatting loud enough for humans to hear them from Earth, new observations show. The star KIC 8462852 garnered popular attention in October, when scientists announced that it showed evidence of periodically dimming by 20 percent or more, which some people theorized could be caused by the shadow of an alien megastructure. However, observations of KIC 8462852 by researchers at the SETI (Search for Extraterrestrial Intelligence) Institute in Mountain View, California, have so far picked up no radio signals that could indicate extraterrestrial chatter. Several natural explanations were proposed, including the presence of a swarm of comets orbiting the star, which lies about 1,400 light-years from Earth. What seized the public imagination, however, was the idea that the Kepler-studied star may host a swarm of alien megastructures in orbit, built by technologically advanced civilizations. With this possibility in mind, the SETI Institute turned the Allen Telescope Array (ATA) on the star, studying it for more than two weeks. The ATA's dishes examined the star for two types of radio signals. Narrowband signals, which make up most SETI searches, are considered plausible for advanced societies to use as a "hailing signal" to announce their presence to other civilizations. Broadband signals might come from spacecraft servicing any alien projects around the star, and could leak from spacecraft propelled by intense microwave beams. "This is the first time we've used the Allen Telescope Array to look for relatively wide-band signals, a type of emission that is generally not considered in SETI searches," SETI Institute scientist Gerry Harp said in the same statement. But the SETI Institute announced in a statement yesterday (Nov. 5) that there was "no clear evidence for either type of signal." The search rules out omnidirectional transmitters that use a minimum amount of energy to broadcast their signal. This minimum is approximately 100 times the total amount of energy currently used on Earth (terrestrially) for the narrowband signals, and 10 million times higher than that for broadband emissions, researcherse said. 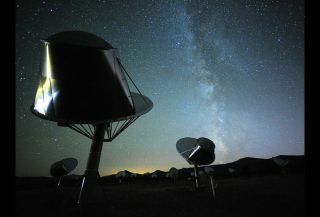 The findings don't eliminate the possibility of alien communications coming from the region around the star — but those communications are weaker than what SETI searches are currently able to detect. The limitations come primarily from the distance between Earth and the star, scientists said. However, researchers also noted that if civilizations around KIC 8462852 deliberately aimed a message in the direction of Earth's solar system, the level of power necessary to make the signal detectable could be drastically reduced. Also, microwave propulsion schemes would be likely to be broadcast toward Earth, further reducing the amount of power required, they said. Finally, researchers noted that any society capable of building such advanced technology should have the ability to access energy approaching 1 octillian watts — that's 10 billion times a hundred billion, or 10^27. Observations of the star will continue, but if an advanced alien civilization is out there, it appears its inhabitants aren't trying to directly communicate with Earth.